Contact Maximum Pest Control For Mice Inspection & Evaluation Estimate. Home and Business Service. Locally Owned & Experts Technicians Nearby For A Pro Pest Control Service Job Types: Mice, Rats, Earwigs, Roaches, Bed Bugs, Fleas, Ants, Spiders De webbing & Control, Report Of All Animals Access Points With Immediate Pest Service. A study by environmental research organizations discovered that a high percentage of rodent problems are initiated in the winter months. Currently is the moment of the year in spring rats & mice have a tendency to happily actively relocate inside places searching for consistent water, a better home cooking mama food all day anytime, as well as sanctuary to breed and stay, it is very important to be knowledgeable about indications of a rodent problem that you have an issue with. Maximum created an important checklist to figure out if your residence is certainly ravaged by them. What Residents Or Businesses’ Require To Search For? Black Pitted Droppings: Searching for rodents droppings around the house is one of the most typical indicators. Gauging around 1/4 – 1/8 long, these black pitted pellets are typically left in a position where food is saved, such as kitchen area closets. Homeowners might additionally discover mouse droppings under sinks, inside eaten cardboard boxes, along the walls as well. Mouse feces can lug damaging germs, transfer major illness such as Hantavirus & Salmonella, as well as activate allergic reactions. They able to creating a lot of droppings a day, so when elimination, making use of safety mask and gloves is crucial maintaining the house from the prospective wellness hazards presented by the rodents. Nests: They like to nest in private dark locations where there is no interactions as well as any disruption from either humans or house pets. Residence mice, particularly, like to construct their nests out of shredded paper items, packaging products, wall surface insulation, and also any type of textiles. If you see these spread around the house, it could be time to contact an accredited mice control expert www.maximumpestcontrol.ca to do mice evaluation for home or business provided by MaximumPestControlServices. Tracks spots indication: Rats usually tend to leave dark brownish marks along wall surfaces as well as floorboards as they adhere to a path throughout the house in between their nest as well as discovered food. Watch out for these marks, which are really brought on by the oily rat hair. Chewing spots indication: They can trigger significant house or any size building damages by eating via nearly any kind of product– consisting of plastic as well as lead pipelines– to stay focused on getting food or water. Mice & rats understood to chew on house electrical cables behind wall surfaces trying to file their teeth, which can boost the danger for a fire in any house or a building. It’s required to maintain looking for any strange chewing activities around the inside of your house, as this is a clear indication of a rodent problem secretly in effect. 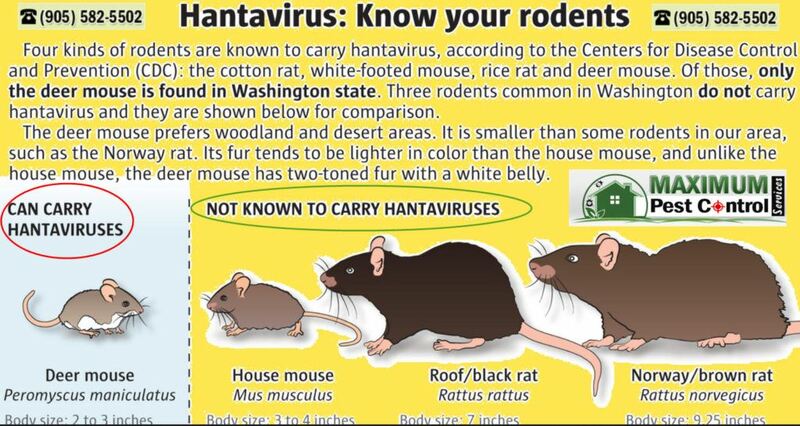 Family gathers rodent infestation: Mice can reproduce fairly quickly, so if you identify one mouse in your house, garage or attic, it’s most likely there are others concealing waiting soon to be populated and discover much more in time. Mouse female can bring to life as much as 35 young annually on every 3 weeks binge giving six infants to breed rodent infestation. Weird traveling sounds: Hearing odd sounds in the wall surfaces, specifically in the evening between 8 pm to 1 am, can be worrying. Possibilities are these noises can be credited to members of rats and mice regarding your house structure, in between the ceiling wall surfaces, including all attic rooms. They are specifically keen on the up attic rooms due to the fact that they love dark, un-remote areas from humans and their noisy pets to safely construct nests to happily breed. Regrettably, upper attic rooms are completely ignored throughout the pest control service job. Ensure to maintain this location dry and well aerated all the time, and also decide to keep any kind of members items stored treasures in secured plastic containers always as opposed to easily chewed cardboard boxes by these rodents. Do you have any one of these indicators of a rodent invasion? don’t do-it-yourself! Mice and Rats are not just a hassle; besides increasing quickly to spread out bad lugs in the air flying in the house conditions. They additionally have the ability to eat via drywall and also electric circuitry inside the electrical box, which enhances the threat for a possible unwanted caused short triggered fire that could lead into a big fire. The most effective point to work with in case of mice home or business invasion is to get in touch quickly with Maximum pest control mice removal specialist to evaluate your house or business as well as suggest an appropriate available package rodent program. Contact Maximum Educated Trained Local Technicians Today Calling Now (905) 582-5502 Or (289) 396-5426. The Best In Pest Removal Service Nearby.